Camilla Chappers: Star Wars Episode 7... Really!? It seems the majority of Star Wars fans around the world shuddered and cried out "whatttt?" when this news broke last night. 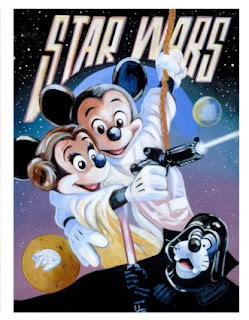 Yes, LucasFilms have sold the Star Wars franchise to Disney - who are now planning a episode SEVEN film in 2015, along with the possibility of episodes 8 and 9 two to three years after that. Really? I'm a little astonished that they want to do this. I didn't believe it at first then I red it properly; surely the six films they have are more than enough for the franchise? Don't get me wrong, I love Star Wars but there's a time when enough is enough with certain things and I feel this is one of them. How much else can improve the already excellent franchise? Is it mainly for money? Probably. I mean Disney already have some part of the Star Wars franchise, with the "Star Tours" ride in their theme parks. Epic ride by the way! No it isn't. I think the current number of Star Wars films has finished the franchise off nicely, all rounding off the story line nicely together and that is that. It'll certainly be a challenge for the script writers to tie it all in with the old films and still keep the old scripts in tact; it'll just confuse people if they put in some irrelevant story line. That is my main concern - what story do they do to fit in with the others? I feel as if George Lucas has just signed his life anyway... Let me put this way. No George Lucas creating Star Wars movies anymore? It doesn't sound right. And the old films are better. Sorry but it's true - I really dislike Hayden Christensen for one. He was good in the first film he did but after, it went downhill; I didn't think he was a good Anakin at all. So who else would be casted? Who will direct it? There's so much questions that needed answering and tying together and I just think maybe it's not right. It doesn't feel right that yet another lot of Star Wars films are being made... There is just something not right about it. It'll definitely be interesting for sure, don't get me wrong - I'll be very interested and love to go see it being a Star Wars fan. Only the Force (or time) will tell whether this is a good move or not for Lucas and Disney.